Heathercombe Woodlands is situated about 3 miles from the centre of Manaton village. It can be approached from Bovey Tracey, Ashburton, Moretonhampstead or Princetown. From Bovey Tracey, follow signs to Widecombe, Haytor and Manaton. About ¼ mile after the roundabout at Bovey fire station follow the road to the right in the direction signposted Manaton (and Becky Falls) only. After @ 4.5 miles you will reach the Kestor Inn in Manaton village. Continue a further 2 miles on the same road until you meet Heatree Crossroad. Go straight across in the direction signposted Heathercombe and Natsworthy. * At the top of the hill go straight-ahead following Heathercombe signs. Continue down into Heathercombe. The car park for garden open days is near the bottom of the hill on your left. 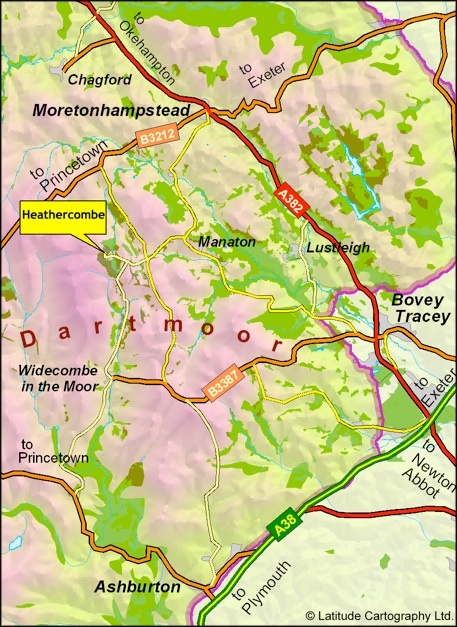 From Moretonhampstead, follow the B3212 to Postbridge and Princetown. After @ 3 miles, having passed Bovey Castle and Miniature Pony Centre, turn left at Watching Place Cross, signposted Manaton. Follow the road for @ 2.5 miles bringing you to Heatree Cross. Turn Right at Heatree Cross, signposted for Heathercombe and Natsworthy. * Continue from * as above.